Off the back of the OLEDC7, which topped this list last year, the OLEDC8 continues LG's winning streak as the best performing OLED television for the price. LG has been leading the charge with its OLED TVs – no surprise, given it's technically LG-made panels being used in rival sets by Sony, Panasonic, and the like. But where the OLEDC8 and cheaper OLEDB8 sibling triumph, is in offering a premium OLED picture at a lower price point than much of the OLED sets out there, widening the user base beyond a few high-earners. Like the rest of LG's OLED TVs, the C8 delivers a punchy, vibrant picture despite a limited peak brightness of only 820 nits. There's no HDR10+ support, sadly – but with regular HDR10 or the more premium Dolby Vision, you're getting rich colors alongside the deep, inky blacks that OLED is famed for. LG has also cracked down on motion handling issues for a cleaner, smoother picture than last year's model. This year's model also features a wider, sloped TV stand that's both pleasing to the eye and acts to funnel sound from the set's downward-firing speakers towards the viewer. Pictures can exhibit a little colour noise when running at the most satisfying brightness levels, and there seems to be some inconsistency between sets when it comes to how much they occasionally reveal ‘bands’ of different black level during dark scenes. For the vast majority of the time, though, you’ll find yourself wondering how a 'low-end' OLED TV in town could possibly look so good. The X1 Ultimate processor offers a host of improvements on Sony's previous OLED sets, giving greater definition to individual objects onscreen and boosting color contrast in what was already a startling clear and refined picture. You're paying a price premium for the privilege, but you can be sure you're getting a brilliant OLED display for the money. The Android TV smart platform has its share of problems (read: bugs), but the new Android Oreo interface introduced here solves a lot of them, and makes navigating Sony's apps and services far simpler, with menu bars for recently watched and favorited channels. An added bonus of buying into Sony's Master Series TV range is the inclusion of a Netflix Calibrated Mode, for calibrating those pretty pixels to best suit TV and films on the Netflix streaming service. Necessary? Probably not. A nice touch? Definitely. We were almost surprised to see LG improve on last year's OLEDE7, but it looks like they've done it. The OLEDE8 sees LG double down on software improvements, reducing picture noise and using a new Alpha 9 processor that really knows how to handle HDR images. The design of the model is still gorgeous, mapping a pixel display onto an astonishingly thin glass pane, even if it's ditched some of the E7's fancier protrusions. LG also saw fit to drop the integrated soundbar, opting instead for a thinner speaker band between the panel and the glass bottom. The speakers inevitably feel lacking compared to last year's model, and it feels like a step backwards in the sound department – but you're still getting a dynamic audio performance with some limited Dolby Atmos capability. It's maybe harder to justify the E8 over the C8, given the similar picture processing, same brilliant webOS smart TV platform, and less of an discrepancy in sound quality. But if you want the full OLED package with the looks to match, and a bit of boost to audio, the E8 is going to be your television of choice. The main draw here is Philips second-generation P5 processor, which manages to double the processing power of the chip seen in the 803's predecessors. The results are stunning, with a Perfect Natural Reality function that algorithmically tweaks contrast, brightness, and definition to optimize your picture on the fly. The effect of Philips' P5 engine may sometimes be subtle with real-world content, but it gives this set an edge when it comes to playing in SDR 4K or HD. You're also getting Philip's unique Ambilight technology, which throws onscreen colors onto the wall behind your television, giving a sense of real atmosphere. 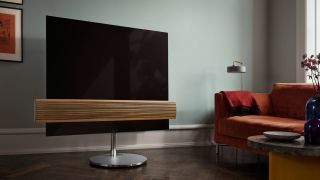 The 803 is technically second-in-line to Philips' OLED, after the OLED 903+, but the only real difference is the latter's integrated Bowers & Wilkins soundbar – an improvement on sound, sure, but you'll save a neat £500 by going after the 803 and sticking with your current sound system instead. There's some input lag, so this isn't as well-suited a TV to gaming as some of the others on this list – and the Android TV interface isn't the most seamless. Not to mention the exclusion of the Freeview Play catch-up service, which is increasingly expected as standard for UK viewers.